نهشته‌های آواری-کربناته‌ آلبین-سنومانین در شمال باختری راین واقع در جنوب کرمان، به ستبرای 526 متر، قابل تفکیک به سه واحد سنگ‌چینه‌شناسی غیر‌رسمی است. واحد یک از رسوبات کنگلومرا، ماسه‌سنگ و سیلت‌سنگ با میان‌لایه‌های آهک و مارن می‌باشد. واحد دو شامل آهک‌های اوربیتولین‌دار با خرده‌های فسیل رودیست، بلمنیت و آمونیت است. واحد سوم از تناوب آهک‌های پلاژیک و ماسه‌سنگ تشکیل شده است. در لایه‌های واحدهای اول و سوم مجموعه‌ای از اثرفسیل‌های قاره‌ای تا دریایی یافت شدند. این اثرفسیل‌ها شامل Koilosoma isp.، Ophiomorpha isp.، Palaeophycus isp.، Planolites isp.، Skolithos isp.، Taenidium isp. و Thalassinoides suevicus هستند. این اثر فسیل‌ها در سه اثر رخساره اسکوئنیا، اسکولیتوس و کروزیانا قابل گروه‌بندی‌اند. در واحد سوم این توالی اثرفسیل هم‌افزایThalassinoides-Phycodesبه فراوانی یافت شد. دهلیزهای داربستی با انشعاب‌های Y و Tریخت تالاسینوئیدسی به یک دسته دهلیزهای پرانشعاب فیکودسی ختم می‌شوند. نمونه‌های هم‌افزای Thalassinoides-Phycodes در توالی مورد مطالعه یک ساختار حفاری-تغذیه‌ای داشته به نحوی که بخش تالاسینوئیدسی آن بیشتر عملکرد حفاری و بخش فیکودسی آن جستجوی تغذیه‌ای را نشان می‌دهد. این اثر فسیل در محیط دریایی و در کفه‌های دور از ساحل (offshore shelf) نسبتاً ژرف گسترش داشته است. با توجه به داده‌های اثر‌شناسی و گسترش اثر رخساره‌ها، می‌توان چنین نتیجه گرفت که حوضه رسوبی کربناته-تخریبی آلبین-سنومانین شمال باختری راین در برش گزک، یک حوضه ژرف‌شونده به طرف بالا بوده است. 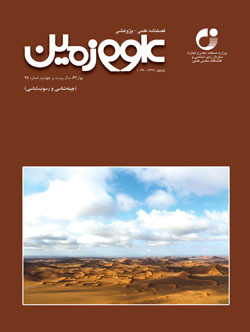 Albian–Cenomanian siliciclastic-carbonate sediments of northwest Rayen in south Kerman, southeast Iran (526 m) are classifiable to three informal units. Unit one includes conglomerates, sandstones and siltstones with limestone and marl intercalations. Unit two is composed of Orbitolina bearing limestones with rudists, belemnoid and ammonite bioclasts. Alternations of pelagic limestones and sandstones formed the third unit. Assemblage of continental to marine trace fossils have been found in the first and third units of the studied section, that include Koilosoma isp., Ophiomorpha isp., Palaeophycus isp., Planolites isp., Skolithos isp., Taenidium isp., and Thalassinoides suevicus. These trace fossils belongs to Scoyenia, Skolithos and Cruziana ichnofacies. Abundant Thalassinoides-Phycodes compound trace fossil, however have been found in the third unit. Box-worked Thalassinoides burrow system ends to multi- branched Phycodes borrows. This compound trace fossil is interpreted as feeding-domicile biogenic structure, so that Thalassinoides domichnium ends to Phycodes excavated feeding burrows. Compound Thalassinoides-Phycodes trace fossil extended in the deeper parts of offshore shelf sediments in the studied section. Based on ichnological data, it seems that Albian–Cenomanian sediments of northwest Rayen deposited in a deepening upward sequence.